As always, use the comments to vent about your own language peeves. This entry was written by whyevolutionistrue and posted on September 26, 2018 at 3:15 pm and filed under Get off my lawn!, grammar, grammar and language. Bookmark the permalink. Follow any comments here with the RSS feed for this post. Both comments and trackbacks are currently closed. Ha! It used to mean drunk, but now seems to indicate something that is excellent or exciting. There was a story this a.m. on the BBC about the evolution of social media jargon and “lit” was an example of how black american lingo is disproportionately influential. I can’t remember the researcher’s name but shouldn’t be too hard to find. <blockquote<"… how black american lingo is disproportionately influential." ‘Twas ever thus — or at least since King Oliver and Louie Armstrong migrated north from the Storyville section of New Orleans and made jazz a thing. I’m guessing it came from a misguided attempt to find a short form of ‘enlightened’. Rather than ‘lit up’ as in ‘pissed out of his mind’. My guess is it’s what happens when you further shorten “legit”, which is what you get when you shorten “legitimate”, but it doesn’t actually mean legitimate, but good or great. I wonder if that means that it is “over-represented”? Ha! I hate “lighted” as in she lighted the lamp” when the past tense is “lit”. The pronunciation of “integral” as “in TEG rul” rather than “IN te grul.” According to the dictionary they’re both allowed, but not by me! I’ve acquired the notion that /IN te grul/ is the mathematical sense and /in TEG rul/ is the “essential” sense. Odd that. Maybe because I learnt the first sense from British teachers and the latter from American colleagues … ? No, it appears that way in my brain too. I learned them both on Sesame Street. They did integrals on Sesame Street?? Musta been the Count. I use INtegral for both cases (yank who lives in Canada and has lived in London). This drives me nuts when someone is giving instructions. It’s helpful to be specific with instructions. Even worse I find tightly woven recipes that go “add these, this and that, blend in those, stir well and THEN QUICKLY ADD THE STIFFLY BEATEN EGG-WHITES” – which have not been mentioned before! Nothing to do with grammar, but a very good way to ruin anyone’s day! I would hate to be the usher collecting that offering! Had not heard that one! Nautical metaphors are lost on landlubbers. Speaking of wet things, I don’t like when people write ‘pour over my notes’ when they really want to pore over them. Not sure if you are serious, but peeps has been around for a while as cool-talk for people. Is “home girls” every used? First heard “peeps” as shorthand for “people” when Harry Enfield used it in sketches involving his ‘Stavros’ Greek kebab shop persona back in the ’80s on Channel 4 in the UK. Not sure anyone using “peeps” now would want to be associated with that – or who’s guilty of cultural appropriation here! yup, me too. And that’s still what comes to mind. Ah, I hadn’t realised that. But I’ve certainly been aware of it for a couple of decades – and used it – before I knew of those marshmallow chicks. 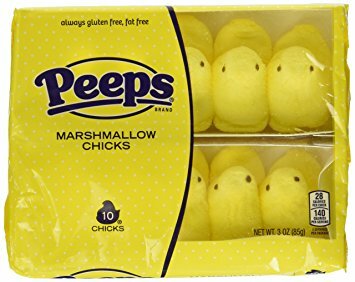 I noticed that on the package for Peeps they have “always gluten free, fat free,” whereas both should be hyphenated: “gluten-free, fat-free.” Hyphens are among the most abused punctuation marks on the planet, second only to semi-colons (and, of course, exclamation points!!!!). That’s a forgivable error, I think, as hyphenation varies from some adjectival compounds. which is grammatically fine I suppose, but carries the condescending implication that what follows is obviously true to anyone who thinks about it. I find it passive aggressive and annoying; just say “maybe …” if that’s what you mean, and if you think what you are claiming is obviously correct, then just come out and say that. “The quote evidence, unquote.” is also incorrect and an abomination! I’d also suggest that the “quote, unquote” needs to be together or the initial “quote” before the word or phrase would puzzle your listener. And you use it only when speaking. When you do, you use other means to indicate the phrase at issue, usually tone of voice but sometimes gestures. The quote unquote is not the delimiter of the phrase, it is an explanation for the different tone used. I kind of like, “Kkk kew”…”Kew kkk”. Like Victor Borge. But you have to be careful not to fling saliva. How I miss old Victor, from my bottom to my heart. Thanks for that! 🙂 I’d forgotten it. What am I missing with the kkk kew? I was wondering about that myself. Out of left field? Now we just need to teach that parrot ( Coco, was it?) to make these Victor Borge sounds! Wouldn’t “quote _____ close quote” be even better? I HATE PEEPS! Both as a way to say “people” and the marshmallows! A good example of “I’m with it” signalling is google’s replacement of “OK” with “Got It”. It just doesn’t grok. I have to disagree. The use of “OK” in computer dialogs has conditioned computer users to expect that some action will occur if the user clicks it, as opposed to “Cancel” which exits the dialog without performing the action. When a dialog exists solely to convey information to the user (ie, no action is implied), using “Ok” can be confusing. Does clicking Ok do something or not? If so, how do I cancel it? The “Got it” button or link doesn’t share that ambiguity. Everyone complains about bad interfaces. Google makes a small improvement, people complain. You have a good point there. It hadn’t occurred to me, but now you point it out, it’s obviously valid. I like Peeps. Disgustingly sweet and yummy. There are a large number of videos on youtube of people putting Peeps in the microwave. My favorite is one that uses Peeps in the microwave to determine the speed of light. Chocolate bars are more accurate. As always, using jealous for envious. Failing to use I and me as subject and object. “ A photo was taken of Sally and I”. Does “it’s me” bug you? Btw, I’m sure I’ve raved here about the wonderful film, Gemma Bovary, from a few years back. Something I spend a fair amount of time noticing, as I used to write a column, *The Language Police*, for the local bar-association monthly. That psychiatric sense, since when? I’d have though the idiomatic sense is much older. Vox pop — Hey, that’s a good one, though I think I’d italicize it in writing. Not really annoying, but I was able to call out a friend on the following minor grammatical issue this weekend. However annoying, substituting “peeps” for “people” is not ungrammatical. Maybe it would be better described as a “lexical annoyance”. Veggies for vegetables — the galloping cutes — aaaaarrrrghhh!!! Galloping cutes, I like that. In our family we say /ve JET a bull/, based on how one of our kids used to say it. You say ve-JET-a-bull? My, but that’s re-GRET-a-bull. Just for humorous effect, if there were any confusion. I was confused by that use of “quote, unquote” for a long time and finally asked someone what the deal was — shouldn’t it be “quote, the words conveyed, unquote” instead? It’s like hearing people say they “could care less.” It’s so commonly used that way that people who grow up hearing it need to stop and ask the question: Isn’t that illogical? I had never heard it used that way until I moved to the US, it seems to be universal here and remains irritating. Another phrase that lost something mid-Atlantic is the English usage “The proof of the pudding is in the eating” which makes sense, vs. “the proof is in the pudding” which sounds as though someone made a dessert from the first copy of a book. Or proofed some whiskey in the pudding? I hear things like “I graduated high school in 19xx” instead of “I graduated from high school in 19xx”. Schools graduate students. Students graduate FROM schools. I’ve heard anchor-persons on the national evening news use the FROM-less version, more than once. That really bugs me, too! To be old-school proper, it should be stated in the passive voice of “was graduated from,” since it’s the board of trustees that does the graduating. See here. You can graduate a cylinder. “decimated” to mean total destruction. That ship has long since sailed. Many words have current meanings that are totally different from their etymology. How many dashboards on computer systems stop mud being dashed up into your face by horses’ hooves? Is that where it came from? I thought it just meant ‘instrument panel’. (Of course it was the obvious place to install the switches and dials). Yes! Exactly that, since early cars were literally horseless carriages. The way in which ‘proof’ and ‘evidence’ are used as though they mean the same thing. Also ‘refute’ for ‘deny’. ‘Refute’ implies that the denial has been substantiated. I blame Nixon for that. Irregardless, the Peeps are so addicting! Using “peeps” as a direct substitute for “people” seems pointless and wrong. However, when used with a personal pronoun, as with “my peeps”, it becomes a handy shorthand for “my friends and associates”. Of course, “my people” might work as well but using a new word allows the meanings to diverge. “My people” has been used in business for quite a while. “My peeps” would never be used in a business context but to describe your friends and family group. All that said, I would probably never use “peeps” but I’m old. I have no problem with “quote, unquote” used properly. It reduces the cognitive load while parsing a sentence relative to its alternative. And when spoken, as it always is, tone delimits the phrase, the “quote unquote” only confirms it was meant that way, not as demarcation of the extent. Yes. I left out that part. I hate it when “theory” is used to mean scientific fact as in the theory of evolution, quote unquote. Go ahead and check out one of my favorite peeps, Ken Ham. Read his books and maybe, just maybe you’ll see the supposably solid proof of evolution for what it is. His books are lit! I cringe when people say “at the end of the day” I have heard people say it 3-4 times in one of their statements on tv. In the past, no one said “at the end of the day.” Now, everyone does, except me. And me. As soon as I hear it, I tune out whatever the person is talking about. ‘Cause, at the end of the day, I don’t care anymore. I hate that phrase too. Years ago, I heard a male client on a decorating show say “if you will” dozens to times. It was an affectation. He sounded snooty and wanted to convey what good taste he had, and said things like, “I abhor knotty pine”. Semicolons. Everyone knows they are supposed to use them, but nobody knows when. They are always a shot in the dark with your fingers crossed hoping you got it right. They should be abolished for causing everyone too much anxiety. Not so; educated writers use them properly. Not everyone is a literarial black belt. Think of the children! Yes, semicolons are to phrases as commas are to words. Semi-colons are great; I use them all the time. They’re perfect for delimiting lists, especially when items in the list are complex and would contain commas by themselves. But some peeps cant’ even use apostrophes properly; its’ no wonder they struggle with the subtleties of semi-colons. The primary use for semicolons (no hyphenation needed) is to separate independent clauses in a compound sentence (although they have other uses, as you’ve noted). Some people, however, don’t like ’em at all. I recall Kurt Vonnegut, Jr., referring to them as the “hermaphrodites” of the punctuation world (which would probably get him in Dutch with the PC crowd now — as might my use of “Dutch,” for all I know). The “ec” ending is pretty common in Slovenian names, and some Slovenian-Americans of my dad’s generation changed the spelling of the last syllable to “ets” to preserve the original pronunciation. One way or the other, the old-country names were bound to give way to American tongues. Dare I ask if you’re any relation to Melania? This is in English. In Spanish, independent clauses are regularly joined by commas–a good way to spot an otherwise fluent foreigner. But then, they also put periods and commas outside of quotation marks. Philistines. Moving swiftly on to colons: I’ve noticed that US writers often start the rest of the sentence after a colon with a capital letter, whereas we Brits almost never do. Another minor cultural divergence! A Yank here who doesn’t capitalize after the colon. Unless, of course, what follows is a quotation or something else that logically requires the capital letter. I think those are stylistic differences and various places have different house styles so it depends on what style guide you follow or who taught you. My understanding of approved practice is, if what follows the colon is not a complete sentence, do not to capitalize. If it is a complete sentence, capitalization is optional, I believe. I’m “looking to” write my pet peeve. Using “meme” to mean some stupid internet thing that popped up for a few seconds. Memes (sense lolcatz) are a meme (sense Dawkins). The Internet is a meme. “Wow factor”. Nearly as common (and as badly misused) as “awesome”. I wince when I hear that something awesome is jaw-dropping, or jaw-droppingly awesome. My impulse is to see if the floor is clean. I always enjoy a bit of Peeves and Wooster, but after a beer and a bump (a phrase that both annoys and amuses) I can’t be arsed to be upset with wurds and such. However, I do very much agree with the post. People saying that “they’re humbled” when a great honour has just been bestowed on them. What’s up with that? We’re seeing that much less often since the inauguration. Peeps. The Soylent Green of candies. The one verbal that aggravates me the most is the pronunciation of jewelry as jool-er-ee. The textual issue I want settled now and forever though, is the use of bring vs. take. I was taught that bring implies movement towards you, take is moving away. I have heard the words interchanged for so long now I’m not even sure there still exists a correct way of using them. But being an old stick in the mud nitpicker true to my 7th grade English teacher, bring means moving towards you and take is moving away dammit! I take your meaning. Bring it on man. Joolery always gets me, too. Also real-a-tor instead of realtor. Another writer I worked with said “template” as templAte with long a instead of “templit”. Drove me nuts. I think we Yanks may say templATe? I know that I do. Well, so do some of we Brits (us Brits?)! Indeed I don’t think I’ve ever heard anyone say “templit”. These and my 1996 Webster’s Unabridged Dictionary with 300,000 entries all pronounce it as templit. As software engineers, me and my associates use “template” quite often. In my lengthy experience, most say “templit”. Occasionally I hear “tem-plate”, but I have no recollection of any correlation with the ethnicity of the speaker. I say templATE I think but perhaps shift between the two. Canucks might say templet. Diana?? Whoops, Diana. Missed your earlier comment. I usually say templATE but I’ve heard the other pronunciation and I’ve probably said it too. I think both pronunciations are used. It’s the same with process. I say it Praw but others say the British Proh. I hear both in Canada. I tend to hear prohcess and prohject more here in Canada. When I was first dating my C@nadian ex in California, he was always talking about his prohject (dissertation). Not sure Brits always say proh, do they? Yes, “Proh” is British. What I’ve personally seen in Ontario (since there are regional differences across provinces) is that in the GTA it is “Praw” but in South Western Ontario (Guelph, KW, etc) it is “Proh”. When I worked in Waterloo people thought it weird that I said “Praw” and all the Americans that worked for the company thought all Canadians (from their small sampling of one company in one area in Waterloo) said “Proh”. My ex grew up near Brantford so thus, probably, the proh. I think a lot of Americans say “prohject” but most do not. That’s my point about regional differences. The US and Canada are big places. Pronunciations can change for some words from city to city not just state to state or province to province. Lol me too. But I bet Dawkins wishes people would stop writing lol. I know he hates it when people begin a sentence with “so” and he thinks only Americans do it but Canadians do it all the time. “Call out” to mean criticize. For the first 65 years of my life, to call out meant to say something aloud. That seems right to me. Suddenly that two-word phrase changed to mean something else entirely. And in this age of coarseness and insensitivity, everybody is always calling out someone or something. I wish we could just criticize them, or point out their error, or say whatever we used to say up until 4 or 5 years ago. I have to challenge you on that. I disagree with you on that. Can’t you just disagree with people anymore or is that rude now? Thanks for calling that out! If we’re descending into Drumpfisms, we gwine be here a LONG time. Poor grammar is the least of my many complaints about him. Off topic: If you haven’t seen Dana Carvey’s bit on Kirk Douglas and Burt Lancaster as gay lovers you owe it to yourself to watch it. One of the funniest things I’ve ever heard. I must have heard something recently that offended me, but can’t think of it right now. Does anyone else know the difference in few and less? Drives me nuts. I meant fewer and less. My wife sure does. And the less said about that (or the fewer things) the better. I am just glad you did not say the less comments the better. I might have had an anxiety attack. The American habit of dropping the “of” from “a couple of” drives me nuts. Didn’t know that was American. I always leave the “of” in but, come to think of it, the people I know who leave it out our Yanks. While very different language appears to evolve . As such a vibrant champion of biological evolution, I am surprised at your reaction to an evolution of a word. I also note your earlier use use of the word beeb which I assume refers to the British Broadcasting Corporation. Ah, the Pecksniffs have appeared, unable to resist equating biological with linguistic evolution. These people cannot help themselves. . . . Sorry if already posted above, but mine is “moving forward,” as in, “What are your plans moving forward?”. It’s superfluous. With you Jerry: I too hate, hate, hate “peeps” for people. Cringe-worthy. Unsurprisingly, people are more verbose when they take credit for something. Overusing or misusing “in terms of”. E.g. “In terms of finance, they are losing money”. Or “this is bad in terms of the environment”. I’ll see your Eg. and raise you one one re. People who say “an historic”. Wrong, should be “a historic”. The h is not silent therefore it’s “a historic” just like “a human”. Nobody says “an human”. Everyone says “an hour” because the h is silent. Or, a generation ago, a shooting brake. Ha! No — “brake” as in “an open, horse-drawn, four-wheeled carriage”; a shooting brake was such a carriage with the space for your guns and dogs, with estate cars fulfilling this role among motor vehicles.